Arlington Chiropractic Clinic, P.C. is Arlington's choice for experienced chiropractic care, serving the area for over four decades. We are the Arlington Heights chiropractor that concentrates on whole health healing, a natural approach to health and wellness. We don't believe in masking your pain with drugs, we would rather find the source of your discomfort. We then use a range of holistic remedies to resolve your pain and discomfort. Arlington Chiropractic Clinic, PC is the only facility in our area to offer services from three chiropractic specialists and a weight loss specialist on staff. 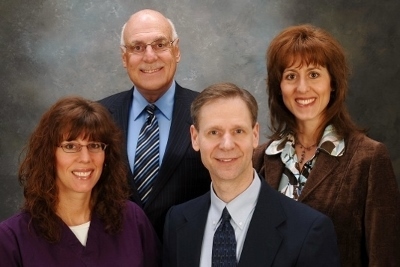 Dr. Gerald T. Andreoli, DC, DACBN, DABAAHP, Dr. Christa S. Andreoli, DC, DACO, MCS-P, Dr. Peter J. Horn, DC, CCSP, and Katrina M. Steckbeck, MS, CCN combine their experience to provide exceptional care in nutritional counseling, orthopedics and sports medicine. Our doctors have over 90 years of combined experience in providing exceptional care for patients in Arlington Heights, Kildeer, Palatine, Rolling Meadows, Mt. Prospect and more. Patients have traveled from out of the area, and even out of the state for the specialized care available at Arlington Chiropractic Clinic, PC. Our doctors and staff are committed to providing the best in chiropractic care and the latest, most modern treatments. We take the time to explain our procedures, processes and treatments. We want you to be comfortable and confident in your choice in chiropractic care in the Arlington Heights, IL region. Our services are designed to relieve discomfort related to pinched nerves, muscle spasms, arthritis, injuries resulting from accidents and more. Chiropractic care has been effective in the treatment of migraines, allergies, back pain and other sources of discomfort and pain. Get the relief you seek with the help of Arlington Chiropractic Clinic, PC. Take Advantage of a Free Meet & Greet Today! It is not unusual for our potential patients to have questions about our care and the type of pain relief we can provide. That's why we offer new patients the opportunity to have a free meet and greet with one of our available doctors or staff members. You don't even have to have an appointment. Just visit our office or you can also call us with your questions or schedule an appointment at 847-243-6593. At Arlington Chiropractic Clinic, we invite you to put your care in our hands. We look forward to assisting you and your family! Use our Hourmine system and book your appointment today! Our live scheduler gives you access to our appointment schedule to find a time that works for you and your busy life. Get your appointment set today! Dr. Andreoli has been a Chicagoland resident her entire life, and developed an interest in natural approaches to healthcare at an early age, because of the positive influences from her father, Dr. Gerald Andreoli. Dr. Horn has been with Arlington Chiropractic Clinic since 1984. Dr. Horn graduated from the National University of Health Sciences in 1983; is a Certified Chiropractic Sports Physician; a Certified Golf Training Specialist, and is Certified in Acupuncture. Dr. Andreoli has been a licensed chiropractic physician for over 40 years. He graduated from the National University of Health Sciences in 1972 with a bachelor's degree in human biology and his doctorate degree. He initially completed a residency in Neurology, and later became Board Certified in Nutrition. He has been named as a Fellow in the International College of Chiropractors. "The staff here is always great, personable, friendly and I love this office. I feel like the doctors and staff genuinely care about my health and well-being and want me to be pain-free and health"
"I think this office is very professional, educated and caring." "The office staff is very friendly and helpful." "We appreciate the warm, friendly atmosphere of the doctors and staff. The doctors are thorough in their diagnosis and treatments. We have been patients here for over 15 years and will always recommend Arlington Chiropractic Clinic to our friends." "My neck spasms, pain and tightness were relieved after 5 weeks of treatment. Dr. Peter Horn and Lauren did a great job with adjustments, exercises and massage." "I woke up with a pinched nerve in my neck. Three days of ‘self-treatment’ of Advil and ice did not help. When my thumb went numb, I called Arlington Chiropractic Clinic to let the experts ‘fix me’. Two months of adjustments and physical therapy, I’m back to my old self (better actually)." "I love chiropractic care and Dr. Christa. I have suffered with vertigo for over a year, but I decided to let adjustments be done. It works for vertigo and any discomforts I have had." "Chiropractic care has helped increase flexibility in my lower back which I have struggled with for years." "I found myself on a hotel room floor in Scottsdale, AZ unable to stand up with severe back pain. I crawled to the phone, found Dr. Andreoli’s number and called him. He helped me get to the Mayo Clinic where I was given sufficient pain meds to make it home to Arlington Heights. I’ve been coming here ever since, and will always be grateful." "Dr. Horn always takes the time to talk to me and address any concerns or issues that I may have." "I highly recommend Arlington Chiropractic Clinic. They really helped me and I never needed surgery." "I’ve had back problems for the majority of my life. I have tried many different methods of treatment, but only one has benefitted me greatly…that is chiropractic care from Dr. Horn." "I told everyone that I didn’t believe in chiropractic. When my back went out and I wasn’t able to walk without crying, I felt the only option was to try this ‘weird’ treatment. Without the help that I received I’m not sure what my outcome would have been. I would not be able to do what I do today and how I do it without the help of everyone at Arlington Chiropractic." "I feel that the wellness maintenance program has really benefitted me especially working in a physically demanding profession such as a trade." "I feel like they care about my overall health and not just one area or modality, always thinking solutions. I am encouraged and look forward to a long relationship of care through Arlington Chiropractic Clinic." "I have been coming to Arlington Chiropractic Clinic since 1991. I was experiencing severe lower back pain and after just a couple of visits I felt 90% better and was feeling back to normal within just two weeks." "The care provided at Arlington Chiropractic Clinic allowed me to return to my running schedule within 4 weeks. That is incredible. Thank you!" "The atmosphere of the office and staff is excellent." "With a chronic back problem that seemed to pop up with no reason, I was always frustrated. I feel more in control of this issue and attribute it to Arlington Chiropractic Clinic." "Since my first appointment the wonderful staff has helped me with the pain and made sure that I always felt comfortable. They helped me to improve daily activity movements and have given me an overall treatment program that has helped so much with my body." "My neck and back need a tune-up now and then, and it’s the only clinic I go to."